Field Hockey BC considers formal coach education to be an essential driver for field hockey development across British Columbia. The National Coach Certification Program (NCCP) is the Canadian formal coach education pathway governed by the Coaches Association of Canada (CAC). 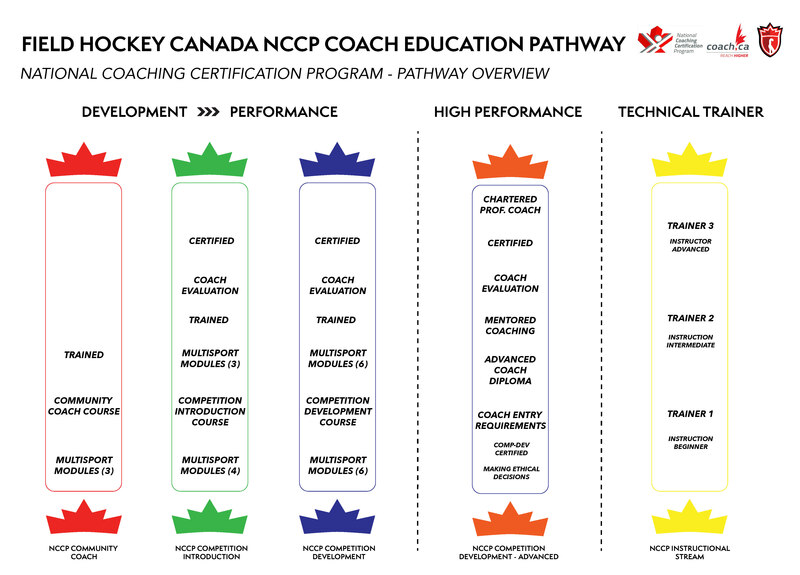 The NCCP Pathway provides both coaching theory and field hockey technical instruction and is tailored for delivery at both a junior and senior professional development level. In this module you will be guided through the NCCP Making Ethical Decisions and Making Headway training. These are essential pre-requisite knowledge courses for all coaches intending on undergoing the Evaluation stages of the Learn to Train through Train to Compete courses. Therefore any coach or prospective coach who has not completed these modules should attend this session. This is an entry level course, suiting all community and club level coaches. Covering essentials such as field hockey practice planning and some key coaching and learning essentials, this course is particularly tailored to the FUNdamentals stage of athlete development. New and inexperienced field hockey coaches who want to learn the basics of coaching and of field hockey should take this course. Once you have completed the course, you will have obtained a “Trained” status in the Fundamentals / Community Course. This course covers the technical and coaching pedagogy essential to the developing coach and focuses specifically on the delivery of sessions to athletes within the Learn to Train stage of development to which technical mastery is of primary importance. This course is best suited to coaches working with young people who want to develop the technical proficiency of their coaching to deliver fun and safe sessions to improve their athletes technical ability. Once you have completed this course, you will have obtained “In-Training” status. You must complete both Competition Introduction Course 1 & 2 to obtain Competition Introduction “Trained” status and thereafter complete a practical evaluation and a portfolio to obtain “Certified” status. This course is particularly suited to coaches of athletes in the Train to Train stage of development as well as the more experienced coach. This course requires involvement in a number of specialized CAC Coaching Theory Modules, as well as, completion of the field hockey technical instruction. This course is particularly suited to those coaches involved in performance level instruction. Once you have completed all modules for this course, you will have obtained “Trained” status. A status of “in-Training” is awarded as candidates progress through the various modular course components. Once ‘Trained” status is achieved, candidates thereafter complete a practical evaluation and a portfolio to obtain “Certified” status.